Triple negative breast cancer (TNBC) is the most aggressive type of breast cancer characterized by a molecular heterogeneity. Due to the molecular heterogeneity, the lack of common targetable molecular alterations, there are only limited therapeutic options. Therefore there is a high medical need for new therapeutic approaches. Encouragingly, recent studies report a high immunogenicity of TNBC tumors. Thus, the proposed approach to induce an integrated anti-tumoral immune response directed against both shared and mutated tumor-antigens on a single-patient basis is particularly suitable to meet the high unmet medical need in these patients. TNBC is an aggressive, molecularly heterogeneous cancer defined by a lack of estrogen receptor (ER), a lack of progesterone receptor (PR) and absence of Her2/neu overexpression. 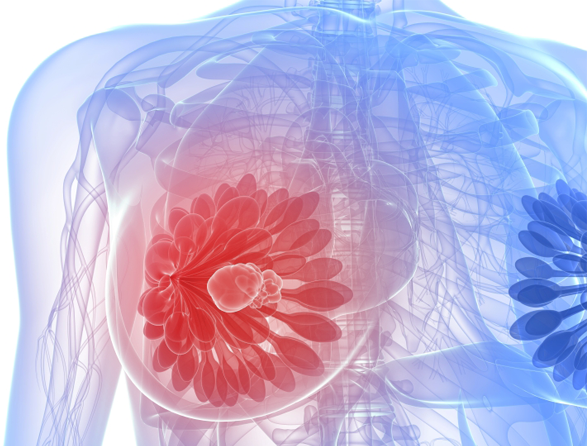 TNBC accounts for approximately 15-25% of all patients with breast cancer, is more likely to affect younger women and is frequently associated with a progressed clinical stage at diagnosis. Due to the molecular heterogeneity, lack of common targetable molecular alterations, many targeted therapies have failed to provide clinical benefit in a significant fraction of TNBC patients. Encouragingly, recent studies report a high immunogenicity of TNBC tumors. Thus, the proposed approach to induce an integrated anti-tumoral immune response directed against both shared and mutated tumor-antigens on a single-patient basis is particularly suitable to meet the high unmet medical need in these patients. The MERIT study will be a non-randomized, non-controlled therapeutic phase I/II trial in patients with TNBC. The vaccine will be administered on top of first line adjuvant chemotherapy. The scientific rationale is that a vaccine tailored to the individual genotype of a patient’s tumor will have enhanced efficacy compared to classical vaccines. The MERIT phase I/II clinical trial will be conducted at 5 European clinical centers. Three centers are partners in the MERIT consortium. All selected clinical trial centers have a documented track record in clinical care of breast cancer patients and strong involvement in early immunotherapy trials with complex biomarker logistics. IGR is one of the consortiums partners, which is involved in the preclinical development but additionally also enrolls TNBC patients in the clinical trial. The institute is one the largest clinical cancer centers mobilizing 3000 employees. In 2014 they treated 47600 patients and participated in 369 clinical trials comprising 13 units with 36 study teams. Supplementing the clinical site, they have a strong focus on medical research and education and trained 2300 students in 2014. VUB is one of the clinical trial centers, which also acts as a consortium partner. The Laboratory of Molecular and Cellular Therapy of the Medical School of the VUB is actively involved in the preclinical studies and participates to the clinical trial. The medical oncology department will recruit patients eligible for the clinical trial. The clinical trial will be conducted at the university hospital, UZ Brussels. As a top-rate hospital, UZ Brussels has gained recognition at national and international level. With its 700 beds, each year UZ Brussel admits more than 25,000 patients and treats 400,000 outpatients, both national and international. The UU is involved in the validation and development of the target identification and confirmation process and together with the Uppsala University Hospital participate in the clinical trial by contributing to the patient recruitment. Today Uppsala University Hospital is one of Swedens’ biggest and a full-scale university hospital with 8,000 employees and 1,000 beds. Each year there are 55,000 admissions, 328,000 physician encounters and 328,000 out-patient treatments. The Department of Obstetrics and Gynaecology of the University Medicine supports the MERIT project under the lead of Dr. Schmidt, but is not a member of the MERIT consortium. The department including the center for gynaecological cancer is a highly experienced clinical trial center and has profound knowledge with the research and operation of cancer studies over a wide spectrum of indications. The NCT in Heidelberg, Germany, is a leading-edge cluster combining interdisciplinary patient treatment and cancer research. Approximately 20% of the NCT patients are enrolled in clinical trials and currently 300 oncological trials are ongoing. Prof. Dr. Schneeweiss is the principle investigator of the MERIT trial in Heidelberg. Several characteristics make RNA particularly attractive as a vaccine. Multiple different RNA sequences can be manufactured using a uniform, fast and simple manufacturing process and can be qualified using the same analytical methods. The RNA vaccine of the MERIT project is modified to improve the processing of the antigens and to create an efficient stimulation of the immune system against the tumor cells. Strikingly, the RNA platform will be combined with a personalized therapy concept that integrates personal disease genomics and on-demand vaccine manufacturing to create customized therapies. As every patient’s tumor mutanome bears a highly individual mutation “signature”, the MERIT project proposes a new therapeutic concept integrating tumor profiling by next-generation sequencing to guide design of recombinant vaccines that simultaneously target multiple mutations. Under what circumstances could I consider participating in a clinical study? Clearly structured treatment guidelines exist for most diseases in which scientifically validated knowledge is applied for the optimal treatment of patients. This is also the case for treatment of cancer. The guidelines contain treatment methods which optimally suit most treatment situations and they are therefore primarily conside­red when making a treatment decision. In certain situations or advanced disease stages, where regularly available treatment options are not feasible or no longer effective, participation in a clinical trial can be taken into consideration. The most important contact person for a patient is always his or her treating physician who is best able to assess the patient and his or her disease. How can I participate in a clinical study and where can I get information about ongoing clinical trials? If you or a member of your family is interested in participating in a clinical study, please talk to your treating physician about your intentions and ask for advice. Your treating physician will be able to answer your questions and to refer you to a clinical study center. Who is competent to decide whether a study participation is feasible or not? Only the investigating physician at a clinical study center (mostly specialized departments in university medical hospitals) where cli­nical studies are conducted is competent to decide which patients fulfill the necessary requirements to participate in a clinical study. What are “Clinical study centers“? The location where clinical studies are conducted is called a clinical study center. Only the investiga­ting physicians in theses study centers have the scientific competence to decide which patients qualify for a study participation. The decision is taken according to the rules in the relevant study protocols and according to the individual characteristics of the patient´s disease and the criteria which apply to in- or exclude participants from a specific study. What does a clinical study protocol define? The study protocol defines the conditions under which a patient is accepted for participation in a study. Further, it describes in detail the process of a clinical study. Criteria about the different requirements for a patient such as the disease stage, co-medication and coexisting diseases are determined in these protocols. Only patients who exactly fulfill the requirements of the study protocol are allowed to participate in the respective clinical trial. How can I contact clinical study centers? At http://clinicaltrials.gov you have the ability to “Search for Studies” using for example an indication or a company name. The web­site provides a list of all clinical studies that correspond with your search criteria.